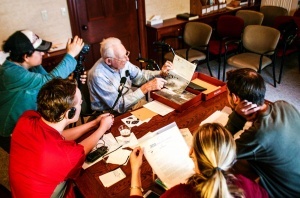 Does a member of your family, community, or organization have an important World War II story you’d like to record? Or does your archive have its own home front collection you’d like to make further accessible to the public? Organize your files in a folder labeled under the Lastname_Firstname of the interviewee. For example, Smith_Jonathan. Please use their given name in the file naming and indicate any preferred or nicknames in the Intake Form below. Within that folder, create Audio, Photos, and Documents subfolders. Add your interview file to the Audio folder; any current and artifact photographs to Photos; and digital copies of the Basic Information Form, signed Interview Release Form, and Photography Log to Documents. Upload all files to our Dropbox uplink. Next, fill out our Intake Form and be sure to use all formatting indicated in the example sections shown. If you do not have information for any given question, please leave the field blank. Finally, please send us a follow up email via info@nationalhomefrontproject.org when your submission is complete, so that we can begin processing the material for our archive. For more information, review a quick one-page summary of our community partnership program here. Thank you for your important contributions to preserving World War II home front history!